Spiralizer Round-Up, Recipes To Use Your Noodler! One of the most used tools in my kitchen is The Spiralizer. If you want to make noodles from veggies or fruit, you need this spiral cutter. This is the one I use. You should check here and here and compare prices. I have the Paderno World Cuisine Model which is usually a bit more than the Epica. They appear similar but I have not compared them side-by-side to verify this. The price fluctuates often, sometimes being as low as $21 but usually it is around $28-$30. The only store local to me that stocks them sells them for $40. So you bought one and now you’re wondering, “What do I do with it?” Besides the typical zucchini noodles (zoodles) with marinara, I gotta tell you this gadget will help you make a gazillion new dishes. Zucchini, sweet potato, carrots, beets, eggplant, they all work well in this cutter I fondly refer to as The Noodler. Plus it’s fun to use, kids love it! Below I’ve rounded up my favorite Noodler recipes from my own kitchen, as well as those from other fabulous food friends. My absolute favorite dish to use The Noodler with is my Japchae. Click through to the post to see what folks are saying about this dish, it’s a BIG favorite of lots of folks. The Noodler comes with three blades. The one I see used least often is the flat blade, which makes lovely ribbons. Heather from Gluten-Free Cat makes this beautiful Green Ribbon Salad. 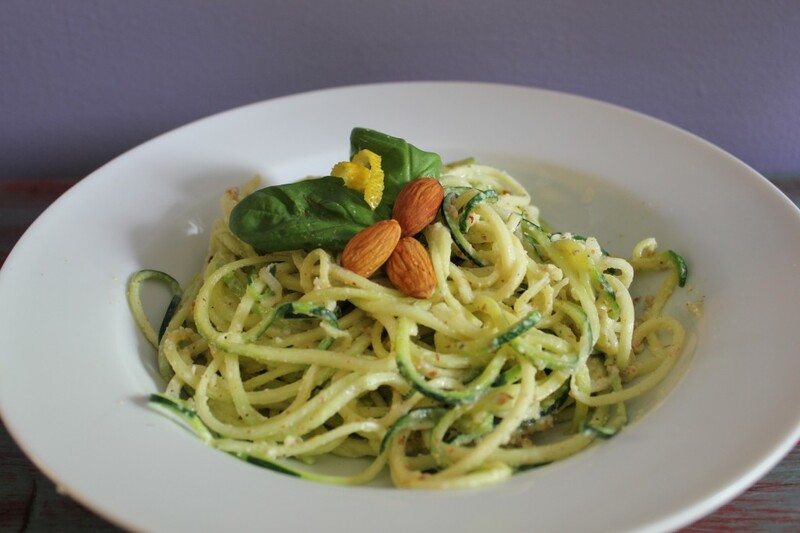 One of my summer favorites is Lemon Almond Pesto over spiralized zucchini noodles. This one is from my own kitchen but I hope you’ll soon find it in your kitchen! 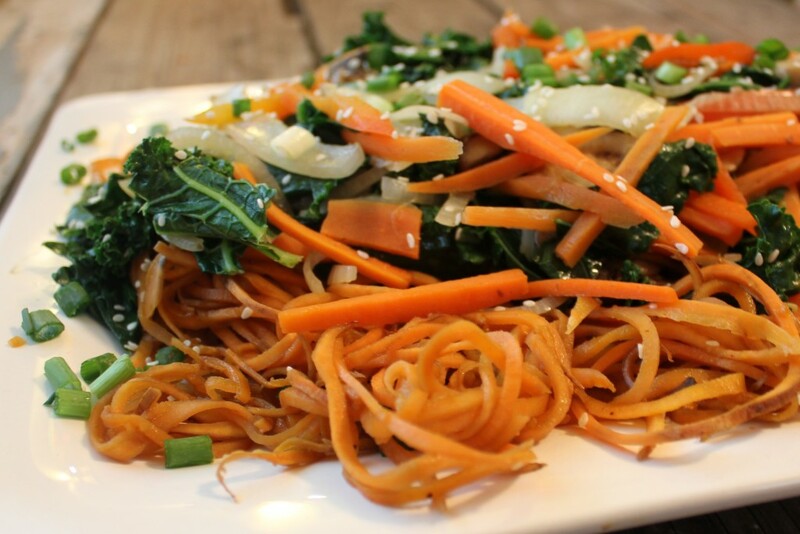 This great Summer dish comes from Karina at Gluten-Free Goddess. 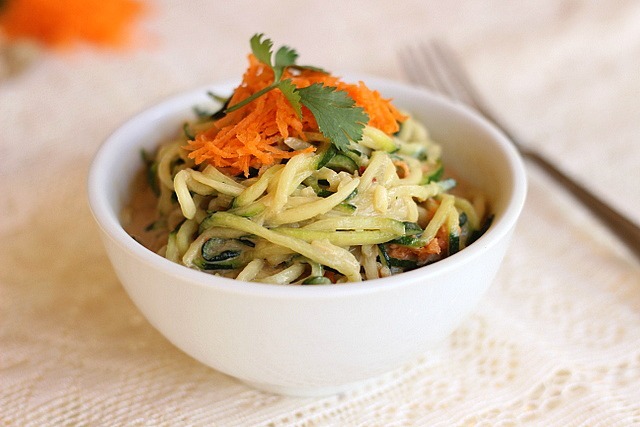 Her Raw Zucchini Pasta in a Vegan Curry Cashew Cream Sauce sounds perfect and it’s beautiful! Another from my kitchen, Pumpkin Alfredo with Sweet Potato Noodles. I usually eat this raw, but also like it warm with the noodles sauteed for just a few minutes to soften them a bit. For those who are enamored with Sunbutter, Lauren from Oatmeal with a Fork shares Spicy Sunbutter NoodlesThis dish is on my menu this week. If you aren’t a Sunbutter fan, just sub PB or almond butter. Super versatile! 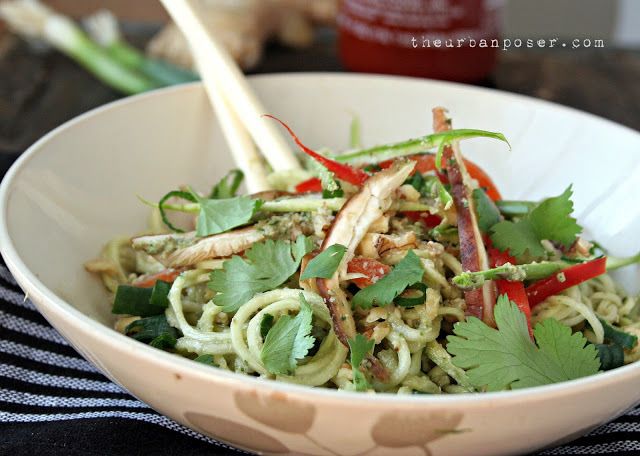 From The Urban Poser, a visually stunning dish, Raw Noodles & Veggies with Raw Asian Pesto Sauce. 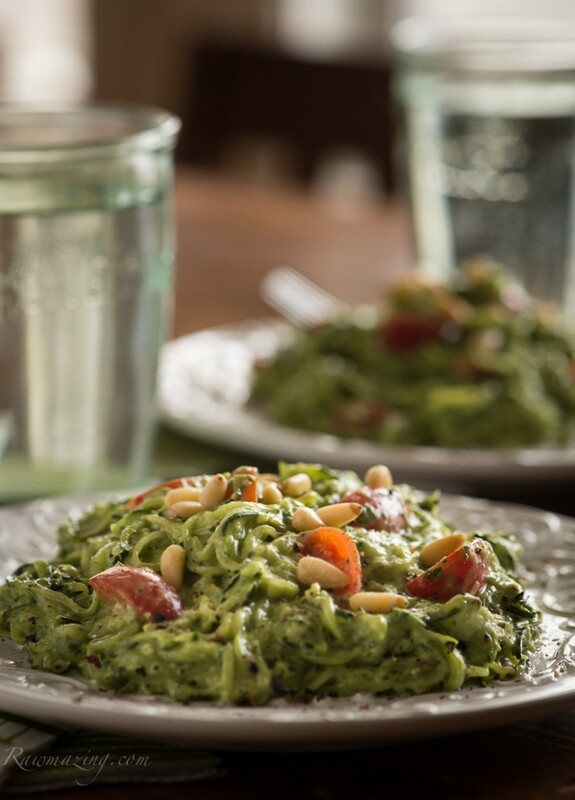 From Rawmazing, Avocado Kale Pesto with Zucchini Noodles. So creamy! 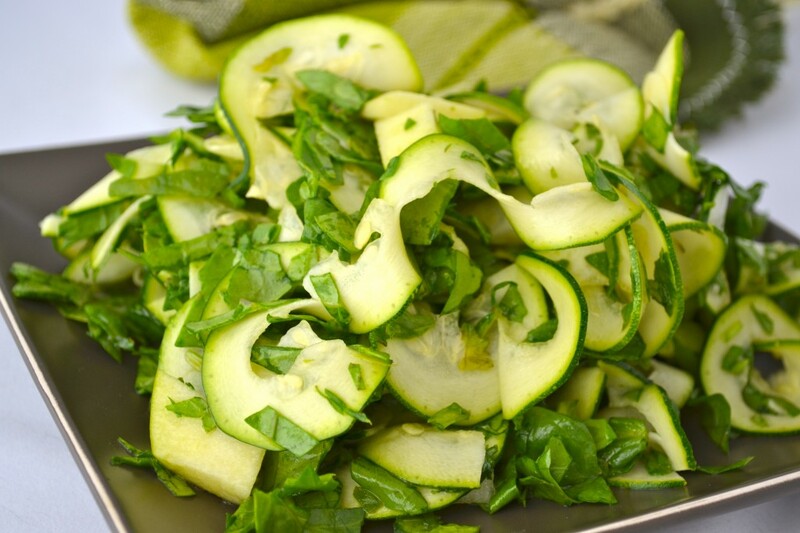 From Averie Cooks, a delightful Raw Pasta Salad with Creamy Lemon Herb Dressing. Averie says this dish came together in 5 minutes. Perfect for busy days when you still crave a light and healthy meal! Whew! What a gorgeous collection of spiralized dishes. Make sure you click through to visit each of the contributors. Their recipes will be a sure-fire way to put your new Noodler to work. I would love to hear what you are making with your spiral cutter. Drop me a note below and I’ll do my best to share links to recipes on my Facebook page. Thanks for stopping by my kitchen! This post contains affiliate links for products I personally own, use and believe in. Should you click on the links and purchase these items, I may receive a small percentage commission. By purchasing via links in my blog posts, you are helping me earn a few pennies to buy a bunch of kale, a pound of flour or a new spatula. 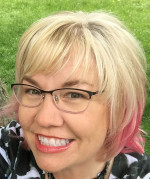 This allows me to continue producing high-quality, free content including original recipes. I appreciate your support! Noodler! I love that word! And I love all of the recipes you shared. Thank you! I get stuck in my noodling ways and need to step out and try some new sauces. Now I have great places to begin, but which one to start with??? Thanks for sharing my Ribbon Salad too, Johnna! Thanks for sharing your Green Ribbon Salad recipe, Heather! I get stuck making the same two or three noodle dishes as well and am excited to try all of these soon! Thanks for sharing your recipe, Lauren. Can’t wait to make it! This is wonderful, Johnna! I just ordered a spiralizer a few days ago, so these are all wonderful ideas of what I can use it for. Thank you so much! Yay for new spiralizers/noodlers, Megan! Can’t wait to see what you create with yours. 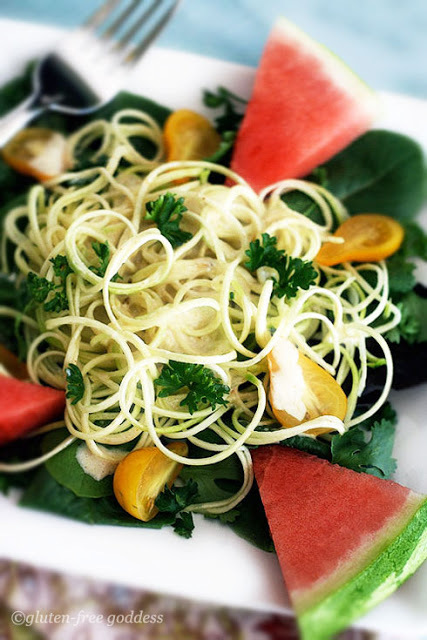 Thanks for including my Raw Pasta Salad with Creamy Lemon Herb Dressing. 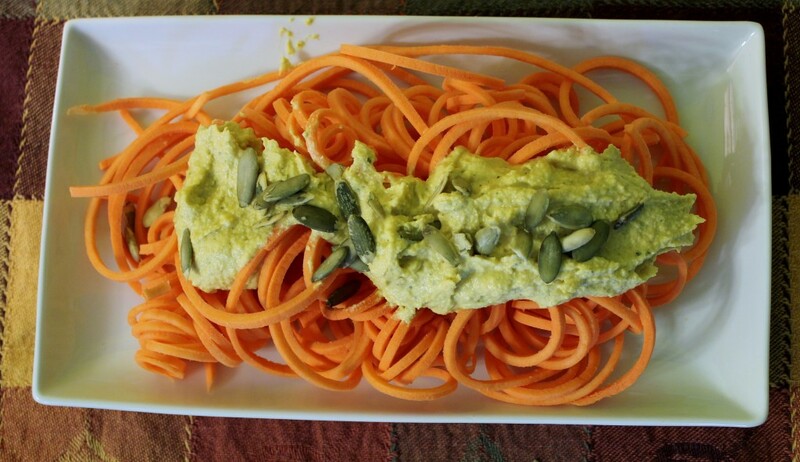 This post reminds me to use my spiralizer more often! Thanks for sharing your recipe, Averie. Can’t wait to make it. Oh, dear Johnna! Happy Healthy Cooking Karma! I was just singing the praises of the noodler! AND the fun we had with Sue creating our delish yam sautee! I do believe that my fella and I be getting a NOODLER for our 44th on the 14th!! IF one does not know what a noodler is, almost sounds like a sassy sort of anniversary prezzie! Thanks for sharing these recipes. 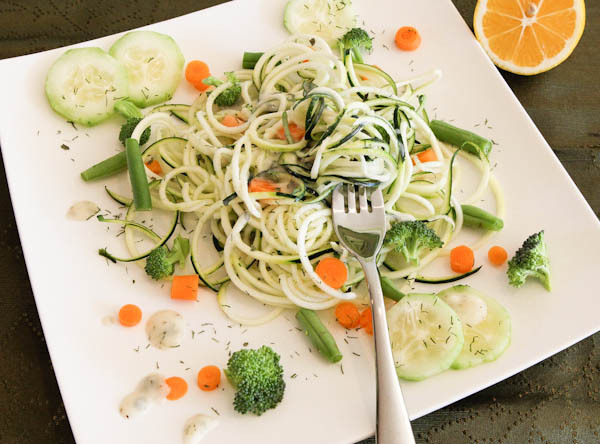 I bought a spiralizer this past winter and can’t wait to try these recipes. I also shared this post on Facebook. Thanks for sharing. I hope you enjoy your spiralizer! I think you’ll have the purchase justified in no time, Stephanie! I don’t bother putting mine away, it lives on the counter we use it so often. Happy noodling!